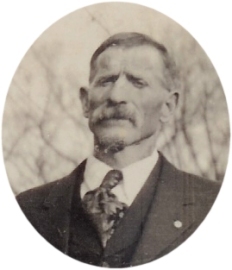 This is Mary Etta Goebel Carey's Uncle Charles. Charles Goebel was born at Scranton, Kansas, March 16, 1867 when Scranton was not much more than a mark on the map. The parental home was on the hill West of the town, known as the Goebel Hill and the side of the Sante Fe Trail. Trail wagons and groups of wandering Indians were familiar sights of his early years. The death of his father when he was a small boy left the mother to take up the burden of rearing and caring for her family. On April 16, 1895 he was married to Mary Bennett of Osage City. They made their home in the Scranton community where he worked in the mining industry until 1917 when he bought the present home, the old Linkenauger place and moved to Burlingame again by the side of the Santa Fe Trail. Here he worked as a stone mason, reared his family and enjoyed the friendship of his fellowmen through a long life. Follwing several weeks of illness he passed away at his home January 25, 1948, at the age of 80 years, 10 months and 9 days. His main interest in life was his home and family. He was a kind and loving husband and father and will be greatly missed by his family and friends. Read the complete obituary which includes his family and friends.